Red vs. Blue centers on the Red and Blue Teams, two groups of soldiers engaged in a supposed civil war. Originally, each team occupies a small base in a box canyon known as Blood Gulch. According to Simmons, one of the Red Team soldiers, each team’s base exists only in response to the other team’s base. It is later revealed that there is no actual civil war; both the Red and Blue armies are under the same command, Project Freelancer, and only exist as training simulations for Freelancer Agents. Although both teams generally dislike each other and have standing orders to defeat their opponents and capture their flag, neither team is usually motivated to fight the other (except for Sarge, the head of Red Team). 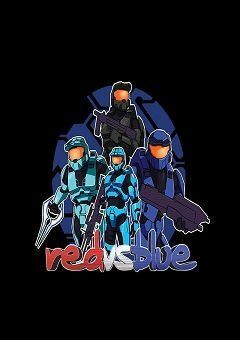 Although the visual background of Red vs. Blue is primarily taken from the Halo series, Rooster Teeth consciously limits connections to the Halo fictional universe. A special video made for E3 2003 portrays Master Chief, Halo’s protagonist, as a larger-than-life member of the army, and the Red vs. Blue trailer and first episode establish that the series is set between the events of the first two games. Beyond these references, the storyline is independent, a decision that, according to Burns, is intended to increase accessibility to those unfamiliar with the games. For example, even though the cast of the fourth and fifth seasons include characters from the Covenant Elite alien race, Rooster Teeth never portrays those characters in their original Halo context. Beginning with the sixth season, titled Reconstruction, the series begins to follow Halo more closely. It is established that Reconstruction onwards takes place one year after Halo 3 and several characters indirectly reference Smart AI, the Human-Covenant War, and Forerunners. Also at several points it is noted that Project Freelancer is under the jurisdiction of the United Nations Space Command.